Every year my boyfriend and I host a themed Halloween costume party… this year’s theme was Superheroes and Villains! At first, I wasn’t familiar with the vast world of comic book characters, but I knew I wanted to find an iconic villain. When I found Harley Quinn it was love at first sight! I’ve never really been a fan of store-bought costumes. I constructed this non-traditional Harley Quinn costume in a weekend, but gathering accessories and designing the makeup became a week long obsession! My boyfriend dressed as the Joker and we rocked our party! We competed with the third game of the World Series, but managed to wreak havoc on the unsuspecting citizens of Glens Falls, NY! This Homemade Harley Quinn Costume is, by far, my favorite Halloween costume to date and I am happy to share it. Now if we can only convince Christopher Nolan to add Harley Quinn to his upcoming installation of the Batman series! 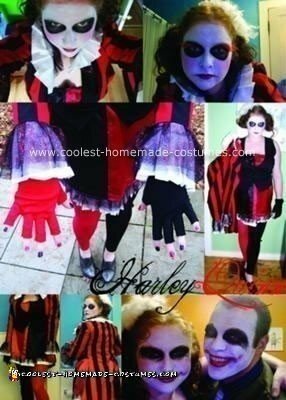 This is a great Harley costume it gave me some ideas to make my own.